After deploying a private algo to an Algo SE server, you may share the algo with other users. All users mapped to the Algo SE server can then see and launch the algo. Users who need to share working instances of algos on a server must be configured with credentials that allow order book sharing on the Algo SE server and all TT Gateways corresponding to the instruments that will be used by the algo. Warning: Proper TT User Setup credentials (i.e., Algo Deployment Allowed and Algo Sharing Allowed) are required to share algos with other users. If users are not setup to deploy or share algos in TT User Setup, they can still have algos shared with them. However, if using X_TRADER 7.12 or lower, users can only have algos shared with them if they share an order book with a user who can deploy & share algos. If using X_TRADER 7.17 or higher, a user can select the other users that they wish to share an algo with regardless of order book sharing. You can also enable (or disable) the Share parameter when updating an algo. For additional details regarding the sharing of algos on an Algo SE server, refer to the TT Algo Strategy Engine System Administration Manual. Right-click the desired algo in the My Algos section. This displays the Algo Explorer context menu. Select Share. This enables the Share parameter on the Algo SE server and displays the Algo Sharing User List. Warning: The algo owner can also enable (or disable) the Share parameter when updating an algo. Do this with caution since Update re-deploys the algo, and erases all templates related to the updated algo, including private algo templates created by users with whom you share an order book. 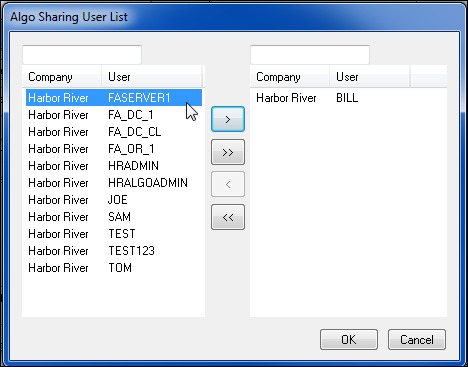 From the Algo Dialog Box you can use the Modify Sharing button to change the list of shared users at any time. Select users from the Algo Sharing User List. If you’re a buy-side user (admin or non-admin), you can share algos with all members of your company. If you’re a sell-side user (non-admin), you can to share algos with all members of your company. If you’re not an administrator, you can share algos with all users in your User Group. If you are an administrator, you can share algos with all users in your User Group, as well as all users in User Groups that you administer. Warning: Shared algos must have unique names.